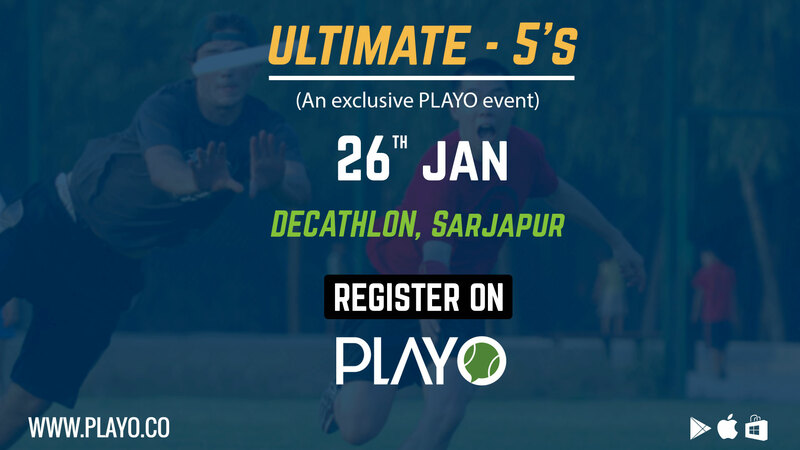 Playo in collaboration with Ultimate Bangalore and Decathlon bring to you Ultimate 5's, an ultimate frisbee tournament with amazing prizes. Ultimate is a non-contact, self-refereed team sport played with a Frisbee. Two teams of seven players compete on a playing field. At each end of the playing field there is an end zone. Each team defends one end zone. They score a goal if one of their players catches the disc in the opposite end zone. Hard cap: 30mins - The game ends in 30mins and will be considered even if its a tie. No extra point will be played. It will considered as a tie game. Spirit Circle in the end of each game. Ultimate relies upon a Spirit of the Game that places the responsibility for fair play on every player. There are no referees; the players are solely responsible for following and enforcing the rules. Competitive play is encouraged, but never at the expense of respect between players, adherence to the rules, and the basic joy of play. It encompasses attitudes and skills such as good knowledge and application of the rules, fair-mindedness, safe play, and spatial awareness, clear and calm communication, and positive and respectful attitude towards teammates, fans, and opponents, in a mutual effort to protect the basic joy of play.